or other legitimate reasons decided on a case-by-case basis. You have to apply for individual part-time studies for at least two semesters. A maximum of 30 ECTS credits can be acquired in these two semesters combined. If this limit is exceeded students revert to being full-time students. Each semester within the part-time studies is counted as half a semester, therefore, two part-time semesters equal one full semester. It is possible to apply until the end of the re-registration period (registration period for the first semester) to the Registration Office. An application should include an evidence to support your personal reasons claim. It should also include an individual study plan that is agreed upon in advance with the Chair of Examination Board. Application may be submitted more than once. individual part-time students have the same status as full-time students and have to pay full semester contribution. 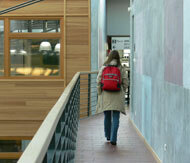 individual part-times studies and state support for students (BAföG) are incompatible. in the case of the calculation of semesters in order to claim the Right to Retry (Part 13 of the Training and Examination regulations) for state examination courses in the Faculty of Law, part-time semesters count as full semesters, therefore, part-time studies make no difference in this case. part-time studies are not possible in all study programs.